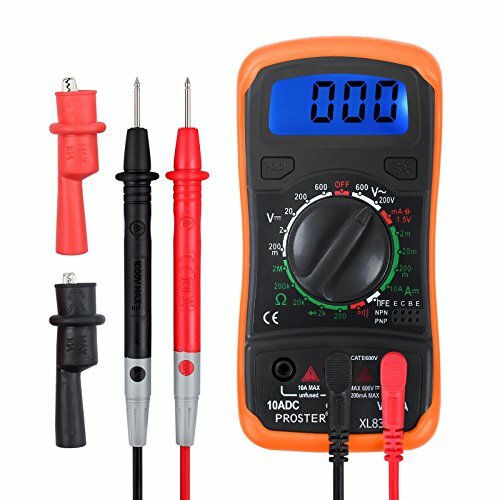 This Multimeter can be used for AC/DC voltage test, DC current test, electric current resistance, hfe (DC amplification) test, Frequency test, two-electrode valve test, NPN PNP transistor test, etc. You can use the Multimeter in more places, such as factory, school lab, home hobby, machine repairing, etc. Digital LCD multimeter, can be used for Ohm AC/DC volt test and overhaul all kinds of circuit boards Auto polarity display/Diode test/Transistor P-N junction test/Transistor HFE test Auto turn off & Data hold function. Low battery voltage indication Continuity test with buzzer sound in circuit Overload protection on all ranges. Max display: 1999, Auto polarity display. Portable and compact design, overload protection on all ranges. Diode assembly test/Transistor P-N junction test/Transistor HFE test. Continuity test with buzzer sound in circuit. DC Voltage: 200mV/2V/20V/200V ±0.5%, 600V ±0.8%. DC Current: 200A/2mA/20mA ±1%, 200mA ±1.5%, 10A ±3%. Operating Temperature: -0 to 40. Over Range Indication: Only figure "1" on the display. Polarity Indication: "-" displayed for negative polarity. Low Battery Indication: - /+ display. Dimension: Approx 138mm x 69mm x 31mm.